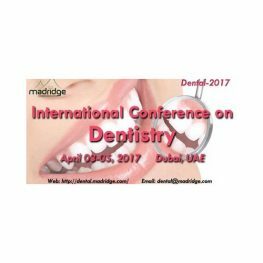 International Conference on Dentistry is going to be held during April 03-05, 2017 at Dubai, UAE. This scientific conference bring upon a new platform to share and discuss all the innovations in the Dental and Oral Medicine. Dental-2017 mainly showcases comprehensive approaches in the advancements in the treatment of dental problems, prevention of oral diseases and dental implant therapy. Dental-2017conference includes Plenary lectures, Keynote lectures and short courses by eminent personalities from around the world in addition to contributed papers both oral and poster presentations. This International Dental Conference is a gathering of experts, professionals, academicians and researchers from all over the world. Meet the experts, strengthen and update your ideas on oral science at Dental-2017 conference.